In a recent blog post, Google announced a private beta of their Google IoT Core platform. 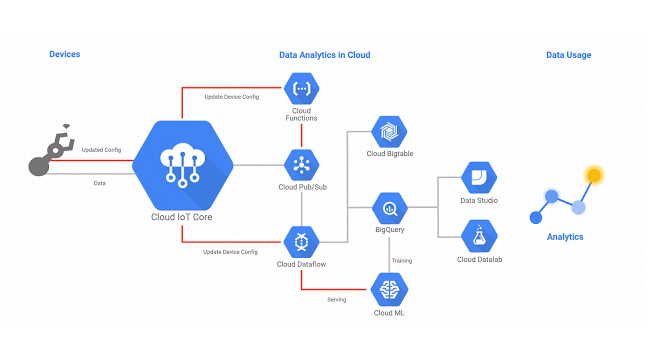 Within this IoT platform, customers will be able to securely connect devices to Google Cloud Platform (GCP) where other data analytics services can be integrated. Customers can then use this data to provide actionable insight for their organization in order to drive better business results. Some of the challenges that organizations encounter in these industries include dealing with fixed operational costs and legacy complexity. In some settings, equipment may be several years, or even decades, old. Using traditional tooling, doesn’t allow organizations to take advantage of cloud-based consumption and investments in advanced analytics. Maintaining security for Industrial Control System (ICS) solutions also poses challenges, due to inherent technical requirements. Many ICS solutions have been compromised as a result of outdated security vulnerabilities including Conficker and the recent WannaCry malware exploit. Part of the reason why these environments continue to be vulnerable is that the management of these devices can be complex. This is an area that Google is trying to address by ensuring organizations have an end-to-end management and security model for globally distributed devices. Another area that Google is addressing is fragmented data that may exist in customer historians. Due to the volume of data that industrial equipment can generate, customers may resort to multiple data silos with short retention periods due to the cost and complexity of maintaining it. Using Google’s elastic enterprise data warehouse, BigQuery, customers can pass on the responsibility of maintaining large datasets to Google. Customers can also take advantage of other services in the Google Cloud Platform, including data stream processing using Google Cloud Dataflow, Cloud Pub/Sub for messaging and Google Cloud Machine Learning for predictive maintenance modeling. In order to visualize all of the data that has been collected, organizations can use partner solutions including Looker, Qlik, Tableau and Zoomdata. Connectivity to the Google Cloud IoT Core occurs through MQTT, an industry standard protocol. To help facilitate connectivity, Google has partnered with some device partners, including ARM, Intel, Marvel and Sierra Wireless to name a few. With Google Cloud IoT Core, we have been able to connect large fleets of bicycles to the cloud and quickly build a smart transportation fleet management tool that provides operators with a real-time view of bicycle utilization, distribution and performance metrics, and it forecasts demand for our customers.